It does not have a brain. It can not swim. But, it is still feared by beach-goers and surfers around the world. Here is the run down on the dreaded Man-Of-War. Rather than swimming the, Portuguese Man-Of-War ( or man o’ war), drifts on the ocean’s surface, propelled by wind. The gas-filled bladder (Pneumatophore) keeps its body afloat while the crest of this marine animal acts as a sail, catching the wind and helping it coast along the surface. With twisted tentacles reaching distance of over 150 feet, used to paralyze and kill fish and other small creatures, this is not something to take lightly. Yet for a human, at the slightest touch, tiny barbed harpoons shoot out of these tentacles, each injecting its victim with a stinging dose of venom. 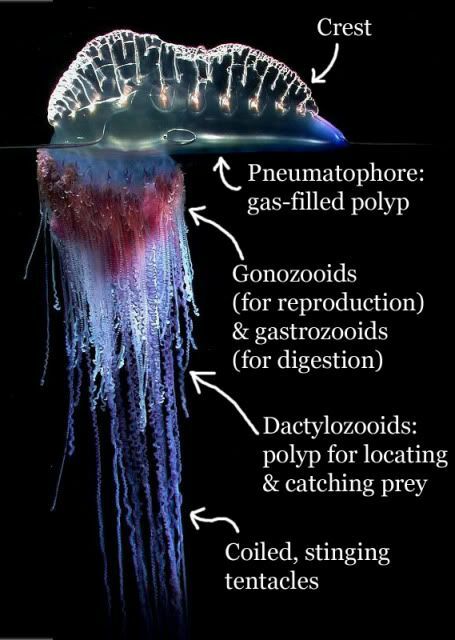 The Portuguese Man-of-War may be mistaken for a jellyfish, however, it is actually a siphonophore (an animal that is made up of a colony of organisms working together) made up as four separate organisms (See photo on right). Man-of-war are often found in groups floating in warm waters throughout the world’s oceans. But don’t run off into a panic! According to the National Geographic Society, Man-of-War tentacles can grow to be much bigger than that, with some growing to be as long as 165 feet. Read your lifeguard signs and warnings. If man-of-war are present, lifeguard stations will post and warn you to watch out before you head out into the water. It is during Florida’s winter months that you will find them washed up on shore. But, a Man-of-War found on the beach can still deliver a powerful sting for several weeks. 3. Don’t pee on your friends! You may have heard that peeing on a jellyfish sting can help. But, chemical changes actually can cause those stingers to fire. Urine, and even fresh water, has now been proven to just aggravate the tentacles and cause them to fire it’s venom. So, What You Can Do Instead of Urinating on Your Friends? 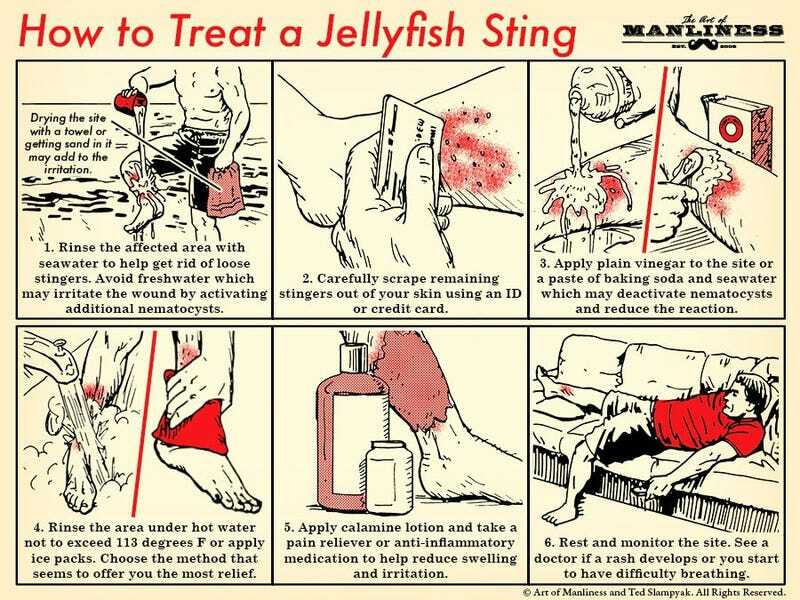 Man-O-War treatment follows the same protocol as that of a jellyfish sting. Jennifer Ping, an emergency medicine physician at Straub Clinic and Hospital in Honolulu, who conducted a study last fall on the efficacy of various jellyfish sting treatments. “Jellyfish stings are caused by contact with the creature’s tentacle, which triggers millions of stinging cells called nematocytes to pierce the skin and inject venom. Ping said the best way to deactivate the nematocytes is to get out of the water, remove the tentacles with something other than your bare fingers, and splash vinegar or some other acidic compound on the wound. This quick guide from the Art of Manliness give you the run down. Most importantly, remember, these beautiful but poisonous landmines sting hundreds of people each day. If you have a bad reaction, seek medical attention immediately. Use what is available. Immediately, rinse the area with seawater to try to get rid of any tentacles. DO NOT USE freshwater as it may activate the stingers. Carefully scrape off the any remaining tentacles. Instead, grab a credit card so you do not sting your fingers. Watch for sever side effects like abdominal pain, changes in pulse, chest pain, headache, muscle pain or spasms, numbness or weakness, pain in arms or legs, difficulty swallowing or intense sweating. Never use an EpiPen. Instead, if any of these happen, immediately get medical attention. Once tentacles are removed and you get home, rinse in hot water to help neutralize the poison or jump in a warm bath with Epsom salts. Apply calamine lotion to reduce the pain & swelling. Take a pain reliever or anti-inflammatory if necessary. Take at least 3-5 Grams of Vitamin C. Vitamin-C is excellent at neutralizing toxin. Crush vitamin C, baking soda and water to create a paste. Apply the paste to the affected areas to pull the poison from the stings. Cold compresses can increase the pressure around the site of a sting, so avoid ice. The use of vinegar and other acidic compounds to relieve pain is also disputed. The scientific review recommends washing stings with vinegar, but only for certain species, of which the Portuguese man-of-war (Physalia physalis) is not one. The ocean is full of amazing creatures that are both beautiful and dangerous. However, by learning a little about these creatures and their natural defenses. We can share their amazing environment and enjoy all our local beaches have to offer. The Portuguese man-of-war—a colonial organism related to the jellyfish—is infamous for its painful sting, but one photographer finds the beauty inside this animal’s dangerous embrace. For nearly two years, retired U.S. Navy combat photographer Aaron Ansarov has collected and photographed man-of-wars that wash up on a local Florida beach. Do Man o War ever float in or wash up on inyercoasral beacbes? Not usually. Just the ocean.